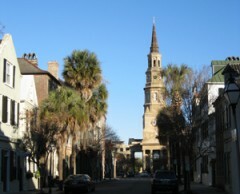 A few days ago I traveled with my family to Charleston, South Carolina. It was my first time in that peninsular city. The place is a hotbed of tourism – stuffed with establishments of fine cuisine, art galleries and architectural landmarks. We enjoyed the visit. I swam laps daily. I brushed up on U.S. Revolutionary and Civil War history. I made a serious dent in a book I’m reading about Cleopatra. I enjoy these bits of writing. I’m glad to be back at home, and on-line.